New Orleans, Louisiana: Historic French Quarter family attraction will find new life at Jazzland Theme Park. Napoleon, Marie Laveau, and even Dracula, are currently being moved into storage to make way for new condos at their former home on Conti Street. The collection will be kept intact for future display at the new theme park. "We are excited to be able to preserve this New Orleans treasure and to give it new life," said Tonya Pope, president of TPC-NOLA who is behind efforts to re-open Jazzland. As Jazzland will highlight Louisiana's unique art, music and cultural heritage, the Musee Conti Historical Wax Museum collection will fit in well with the other planned attractions. "We have just recently started design work on the building that will house the wax figures, but preliminary plans call for a ride attraction that takes guests through the historic scenes." New scenes, wax figures, animatronics, and other features may be added as the design work progresses. The company is planning to use the Haunted Dungeon figures separately within the park, primarily during the Halloween season. The collection is being acquired through the Jazzland Foundation, a 501(c)(3) private foundation. The former Musee Conti building is slated to become 16 high end condos, including three penthouses and onsite covered parking. "We are happy to see the wax figures stay as a complete collection," said developer Jonathan Weber. "City wants to sell. We want to buy." At the most recent IDB meeting, we submitted our updated proposal, along with an offer to purchase the property. The IDB voted to get an appraisal on the property before they move on our offer. Things are looking pretty good to BRING JAZZLAND BACK! In the meantime, we have added the Sportsman's Paradise Resort Hotel to our plans; a unique hospitality offering that is focused on bringing new family tourists to the area. The new brochure can be read HERE. Help spread the word to BRING JAZZLAND BACK! The most recent City/IDB RFP had a due date of February 28. We had the only proposal submitted to the City/IDB by this deadline. However, this does not mean that we have won. Not yet anyway. The City/IDB structured the RFP so that they could continue to accept proposals after the deadline, but would give preference to those turned in timely. We believe our proposal is strong and viable. We propose to re-open the New Orleans park as a true celebration of Louisiana. Jazzland Theme Park would be joined by the Backlot Studios production facility. Future phases would include Baritone Beach Waterpark and the Backlot Shoppes mixed-use venue. The full proposal can be read HERE. Help spread the word to BRING JAZZLAND BACK! New Year, New RFP, New Jazzland! A new year and a new RFP could set the stage for a new Jazzland! As the outlet mall proposal is now officially dead, the City and IDB recently issued a new RFP for the redevelopment of the site. We will be submitting an updated proposal by the due date of February 28. Our plans have remained consistent, although they have matured over the last two years so the proposal will not be exactly the same as the last go round. Our proposal will be publicly posted on Feb. 28th. Be sure to follow us on facebook to keep up to date with the latest information. 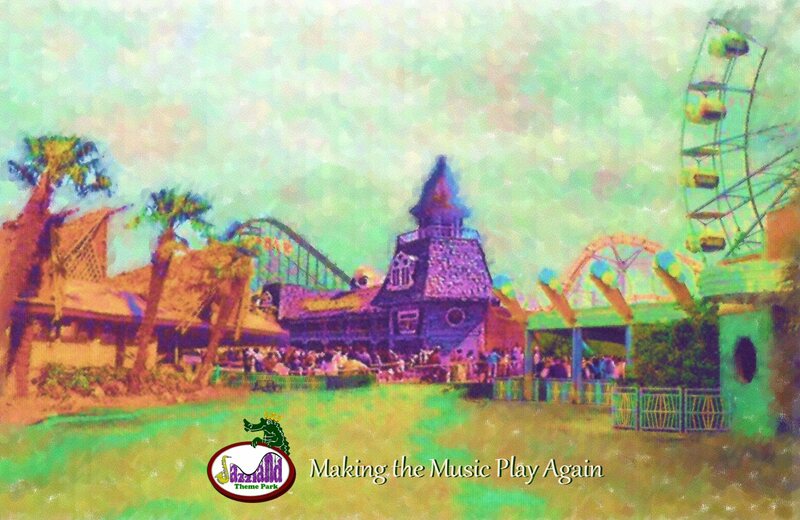 Continue to spread the news to your friends, neighbors and family to help BRING JAZZLAND BACK! © Copyright 2016 TPC-NOLA, Inc.